Allium x nutans 'Millennium' Christmas present, a lovely compact Allium for a sunny well drained position, this is its 2nd flowering. Aralia californica from Craige at Sunnymead Farm, another woodlander the flowers are pretty insignificant, but these berries come out green then change to a maroon red to black. My son has a small dry but moist Creek running through his property and when he was digging this plant up for me to bring to our new garden he took a small division from the side, his would be three times the size of mine. But they will grow quite happily in a shaded position. Colchicums are all out as you come in the gate. Kirengeshoma palmate from Ken and Leslie Gillanders in Tasmania 1985, so many years old, but still a very favourite of mine. 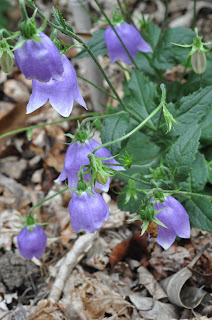 Growing in a woodland position with moisture in summer and a lime free soil. Coming from Japan.